I hope that you enjoy your visit to Arimathea. The basic structure of this page is a series of "weblogs" dedicated to various themes. You can access these different topical realms on the left side menu. Within each topical realm, there are various categories. Each realm has its own imported feeds, links ("blogroll"), and patron saint. 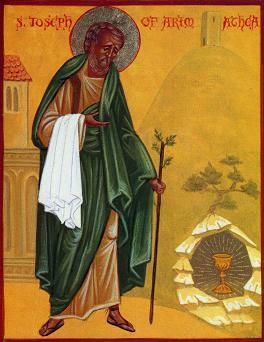 The general patron saint for the page, as for me, is Joseph of Arimathea, naturally. Moreover, the recent entries of all realms are listed in the right column. I always appreciate friendly or thoughtfully critical comments.